Everyone everywhere is living under the threat of violence; it is only the degree to which any given population is aware of this fact that differs. Americans who did not live through the civil turmoil of the 1960s have grown up with the idea of the political as being an abstraction, something only vaguely tangible that occurs elsewhere and which has little to no repercussions in their daily lives. Bombs are dropped on places we have never been, white women are raped a few towns over, Congress debates some bill that we have never read, and some school on the other side of the country teaches children about transgenderism. We are shocked and appalled for the duration of the twenty-four-hour news cycle or until the next must-have gadget hits the market. We believe ourselves, even if subconsciously, to be mostly insulated from the physical consequences of the political. For the vast majority of Americans, politics happens to other people. During Donald Trump’s campaign, this sense of security began to diminish slightly. We saw the violence at his rallies, we saw the frothing mouths of the media’s Jews, and we saw the venomous masses of brown people biting – or at least ravenously hungry for – the white hands that feed them. Still, for the most part, all of this remained external to our lives. Outside our windows, things were okay. It was business as usual and America was open for business. Even for those of us who live in dystopian megalopolises and can rattle off story after story of its myriad inconveniences and horrors, there remained a certain sense that an invisible order still held things in check. Our anger, real and valid though it was, would subside to a tolerable degree after turning the computer off or walking through our front doors and back to our isolated and carefully cultivated sanctuaries. But what we saw in Berkeley this past Saturday was, in fact, the real world. It was the political in its most organic, vital form, and it is coming to a town near you. Beneath the (dwindling) comforts of Western existence there is, and always has been, the boiling magma of true order: nature. Concealed by frivolities, hidden by constructed distractions, cooled by the tapering trajectory of past glories, nature has only granted us a temporary reprieve from its explosive power. Civilization is ultimately nothing but an intense and lengthy negotiation between nature and man in which man presently has the upper hand, albeit only momentarily in terms of historical time. And man only gains the upper hand through blood, sweat, tears, and collective will. It has never been any other way. The political action that occurred in Berkeley was the result of nature beginning to assert itself against the unnatural, against a dying society, against hubris, and against the forces of artificiality. Every punch thrown, every dumpster shoved, every M-80 hurled into the crowd was a reminder that one cannot fight nature forever. No amount of hoping or conning can make falsehoods true. That which is built on a landfill will eventually collapse. The vision of America as a nation of immigrants, as an egalitarian project, as an orgasmic capitalist dream, as a playground for the global elite, is nothing but a historical landfill. Unfortunately for us, the American Left has understood what politics really means far better than the Right. They have always been aware of the seriousness of their mission. They take nothing for granted and they never give an inch. We are often flabbergasted by their seemingly insane nitpicking, ridiculous chants, and demands for apologies for even the slightest infractions of their social codes. But these things are not at all irrational from their point of view. They want to destroy the white world but, at least in America in the “current year,” they lack the guts or honesty for hard, violent genocide. They are content to whittle away at our institutions, our cities, our culture, and our collective self-worth in so many ways and from so many directions that most people become dizzy just trying to understand it all. We have staggered and struggled like punch-drunk boxers until it was almost too late. Almost. For all of their tactical ingenuity and relentless determination, the Left made one colossal error: until very recently, they really believed they had won. They really believed that they were doing little more than kicking us while we were down. They really believed that we would not fight back. They really believed that they had conquered nature. They were dead wrong. No race can be induced to commit slow suicide forever, and no race will continue to allow itself to be oppressed by others once they become aware of their oppression by putting names to faces. The Left’s decades of race denial have, in fact, done them more harm than good. They have contorted themselves intellectually beyond any semblance of rationality in their efforts to delegitimize white identity, and so have ignored the undercurrents of nature generally and biology specifically that are at the root of all things. While they were convincing us (and themselves) that whiteness was a pathological social construct, nature marched on, indifferent to their comical drivel. And this is why they will, without a shred of doubt, lose their war on whites. 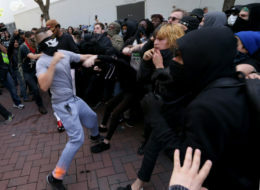 The reality of nature, of the biological imperative, and of the power potential of white men who will not lie down and die was made clear in Berkeley, both to the Left and to the spineless bourgeois fence-sitters on the fake Right. And don’t think that our enemies will forget or treat this as an isolated incident: the Jewing will increase, the shaking will get more literal, the braver among them will become even more violent, and the denunciations and disavowals from those we thought were on our side will become more frequent. But, more importantly, we will not forget, nor will we treat this as an isolated incident. We have noticed their disgusting slander, their hatred, their deception, their crimes, their intellectual vacuity, and we will no longer apologize, appease, grovel, and shirk from our duty to our ancestors and our children to ensure our survival. This is not what they wanted, but it is what they should have expected. Despite the stereotype of Leftists as intellectuals, they demonstrate time after time that they have no true grasp of history, no deep conception of civilizational cycles, and no willingness to accept the universality of resistance to communal destruction. They understand historical progression in strictly material terms and almost entirely ignore the spirit. Just as civilization is a negotiation between nature and man, the political within any given civilization is a negotiation between violence and order. The Left sees itself as the arbiter of both violence and order, i.e. as the sole legitimate manifestation of the political. They can hardly conceive of real resistance because they live in a system that has protected them, and which agrees with them on most of their fundamental premises, for so long that they cannot see the forest through the trees. But they just might see race through the fist. This is not at all an encouragement of violence but simply an honest acknowledgement that it exists, and those who seek it will find it anywhere they look. The days of complacency are over. The Left is losing its ability to kick whites around. But we must keep up the pressure. We must be spreading our message everywhere and increasing our numbers. Each of us must do his part, large or small. This is far, far from over. All living creatures defend themselves. And, though this will come as a shock to many people, white men defend themselves also. This is nature in its eternally triumphant splendor. The Left – those sniveling, flabby-souled nature-deniers – will learn this lesson in city after city and town after town.